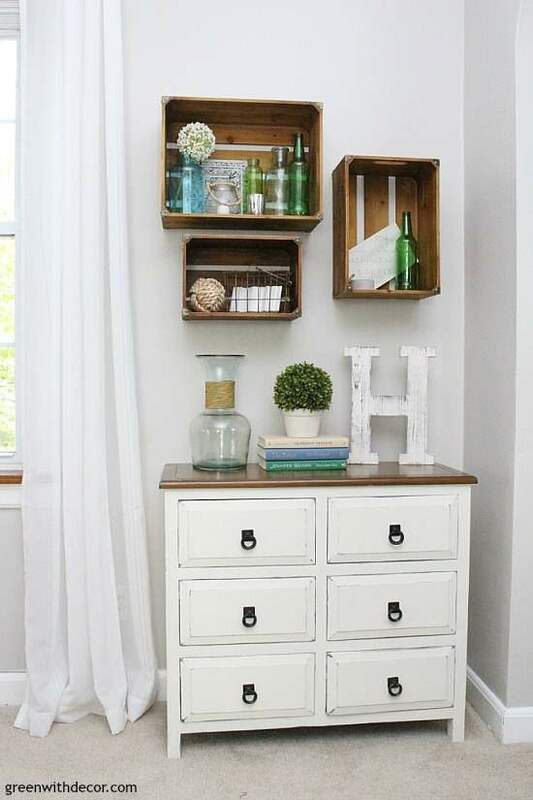 Learn to give a dresser a chippy farmhouse look. Transform any dark dresser into a white chippy farmhouse piece with this easy clay paint tutorial. I went through a phase where I painted everything black. Everything! This dresser, this dresser, this nightstand, the ladder shelf in our living room … you get the picture. Well I’ve gone the complete opposite now. I’m painting everything white. I have another fun white furniture makeover to add to the list today: this dresser. This dresser might look familiar. We had it our small foyer in our Milwaukee house. It worked well for us for a long time, but I was ready for a change. So big surprise, I’m busting out Country Chic Paint’s Vanilla Frosting – the perfect white farmhouse paint color! Take the drawers out and remove the hardware. I loved the black metal drawer pulls on the original piece and knew they’d really pop against some new white farmhouse paint, so I was excited to reuse them. The top of the dresser was wood, and after these two-toned white and wood nightstands for my mom that we painted earlier this year, I decided I needed a white and wood piece at our house. This dresser was obviously the perfect choice. I used painter’s tape to mark off the wood top to avoid any stray brush marks. 2. Prime your dresser (if it’s dark originally). I don’t typically prime furniture when I’m using clay paint because the coverage goes on so well. But since this dresser was a dark black, I primed it so I wouldn’t have to do as many coats of the Vanilla Frosting. When I painted this bookshelf with clay paint, I didn’t prime it first, and it ended up taking a lot of white paint to go over the black. If you’re priming, make sure to stir the primer first, then apply the primer in the same direction as the wood grain of your piece. If you’re painting a light colored piece or using a darker colored clay paint, you can skip the priming. Be sure to shake and stir your paint so it’s mixed well before you paint. Then just start painting! Apply the brushstrokes in the same direction as the wood grain. Let it dry overnight. Then apply your second coat and let it dry for a couple of hours. This step is optional depending if you want the chippy farmhouse look or not. If you want to see what furniture looks like with the Vanilla Frosting color without distressing, you can see my painted bookshelf makeover. 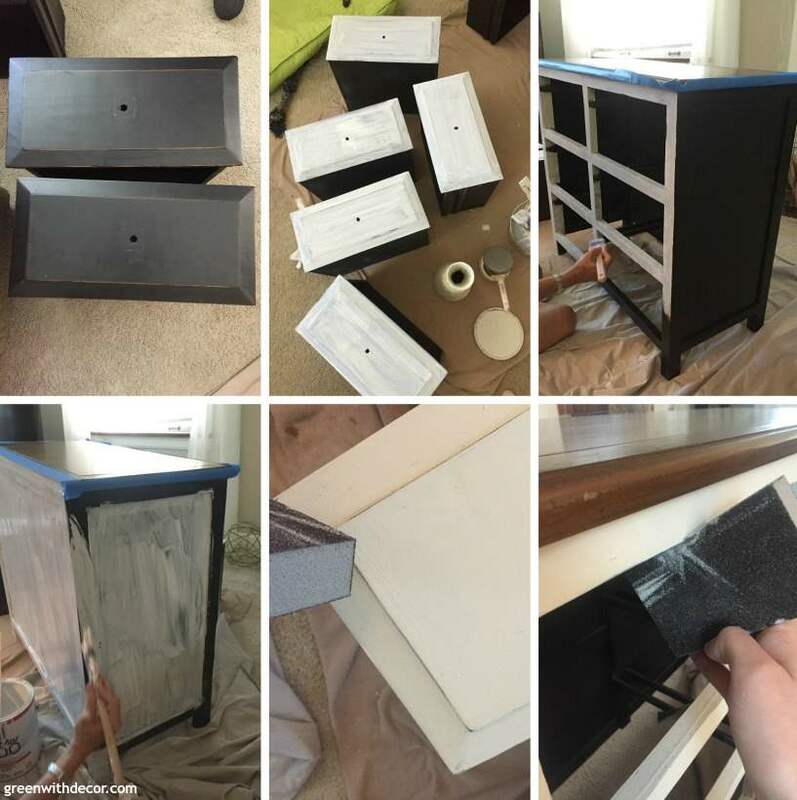 Since the drawers had such great trim detail, I used these Ultra Flexible Sanding Sheets to wrap them around my finger and sand the edges without taking the paint off the rest of the drawers. I used my favorite sanding blocks to sand the edges of the drawers and dresser frame. Start by applying light pressure and rubbing the sanding sheets or sanding blocks across the surface, then apply more pressure depending how much of a distressed farmhouse look you’re going for. If you take too much paint off, don’t panic. You can always repaint any mistakes. Let your dresser dry for 24-48 hours then apply wax to seal your piece. Swirl your brush in the wax and apply to your dresser in a circular motion. Wipe off excess wax with a clean, lint-free cloth. Reapply the wax every 6-12 months to keep your piece protected. With a dresser like this where we kept the original wood top, we can go on the longer edge of that since we don’t have anything sitting on top of the paint. 6. Put the hardware back on. I have a confession. We were planning to use this dresser as our TV stand, as you can probably tell from this before pic. Then we both decided we really loved the white dresser under the wood crates so it stayed there. Now we’re on the hunt for an old piece of furniture to paint and use as a TV stand. We’re currently using our outdoor coffee table – just keeping it classy. I’m okay with it, because this little corner of the living room is looking so good. Have you given a dresser a chippy farmhouse look? Have any painting projects planned? Thanks, Susie! I love the color, too!